"My family's favorite summer meal!" In a large pot with boiling salted water cook pasta until al dente. Drain. Meanwhile, in a large skillet heat oil, add garlic and cook until tender. Add the zucchini, salt, red pepper flakes, dried basil (if using) and saute for 10 minutes. Add chopped tomatoes, bay scallops, and fresh basil (if using) and simmer for 5 minutes, or until scallops are opaque. Pour sauce over cooked pasta and serve with grated Parmesan cheese. 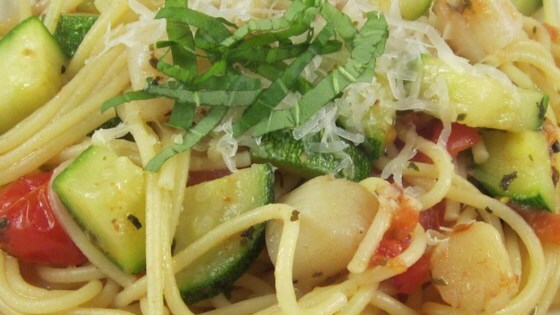 See how to make a simple pasta with scallops, zucchini, and tomatoes. I've tried many recipes for scallops, this one is the best! Didn't have roma tomatoes on hand, so I added a can of diced tomatoes. Will make this one again and again!! Awesome!!!!!! !I noted other reviews, I used angel hair pasta, added bay seasoning, one small can of tomatoe sauce. The kids loved it!!! This was a really good summer pasta dish. I sauteed onions with the garlic and I also added sugar snap peas, since I had them. This is definately a keeper!